The first bricks of a £5.7M project are about to be laid in Harworth as Bassetlaw District Council, A1 Housing and construction company Woodhead embark on the first major social housing project in the district for 35 years. 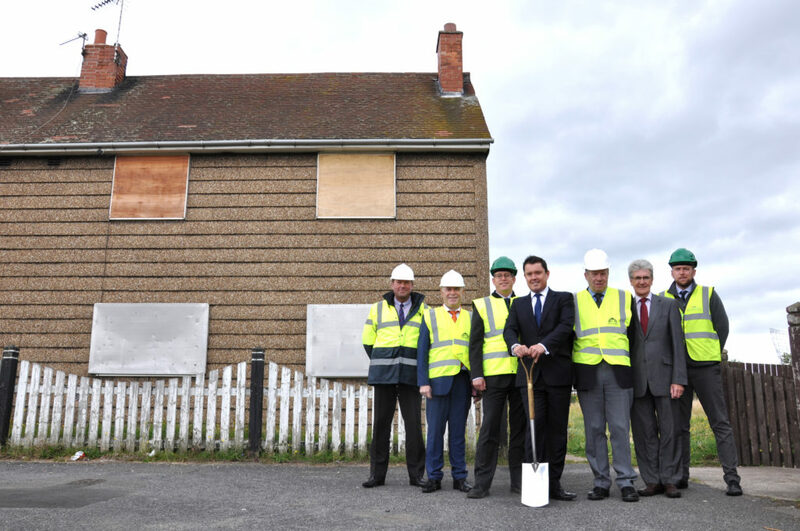 Work to build 43 new homes on Smith Square has begun and will see the non-traditional ‘Airey’ houses – a pre-fabricated house built in the 1950/60s – on Smith Square and Thompson Avenue, Harworth replaced with modern, energy efficient homes. The news comes after award-winning construction company Woodhead were officially announced as contractors, in addition to the confirmation of £1.02M worth of government funding from the Homes and Communities Agency. Phase One – No’s 17 and 18 Smith Square will be demolished to allow access to the former playing field where 19 properties will be constructed. Phase Two – Tenants living on Smith Square will move into the new homes and the remaining eight ‘Airey’ houses will be demolished to make way for 24 new properties. Phase Three – Tenants living on Thompson Avenue, Common Lane and Styrrup Road will move into the new properties on Smith Square and the existing ‘Airey’ houses on Thompson Avenue will be demolished. Subject to further funding and resources, 28 new homes may also be developed on the former Thompson Avenue site, potentially taking the total to 71 new homes. “There has been a lot of hard work and planning to get the project to this stage and I am delighted that we are now in a position to deliver more social housing within the district. “This is a great milestone for both A1 Housing and the Council and will be the first time in more than 35 years that we have embarked on a building project of this scale. “The development has been designed to accommodate the needs of tenants who currently live in this community as well as paying close attention to potential future housing demands. “We’re delighted to have been awarded the contract to develop the Smith Square site in Harworth. “Working on a site such as this for three years, building a range of modern, energy efficient flats, family houses and bungalows, gives us the opportunity to have a wider community impact. “It’s very important to us at Woodhead that we involve local communities in the sites we work on. We will be providing local companies with continuity of work, which encourages local employment and training opportunities, including apprenticeships, work experience and site visits for young people and other community involvement schemes. Woodhead were selected following an extensive tender process which was conducted with the assistance of Efficiency East Midlands. “We are committed to helping organisations get the best value products and services, as well as providing added value to any project through employment and skills, community engagement and social impact initiatives.